You can incorporate flax seed into your diet either as ground seed or as flax oil, which is used in cooking. There are two types of flax seed: golden and brown. The main difference between the two is their color -- both have a similar flavor and offer the same health benefits. Flax seed was first cultivated around 6000 B.C. in eastern Turkey. The seeds can be golden-yellow or reddish-brown. Whole flax seed contains 41 percent fat and 28 percent dietary fiber. It is a good source of omega-3 fatty acids, lignans, zinc, magnesium and potassium. It is also a good source of soluble and insoluble fiber. According to Dr. Katherine Zeratsky, R.D., L.D., whichever from of flax seed you use, ground is more beneficial than whole because the ground seed is more easily digested. Whole seed can often pass through your intestine undigested, meaning that your body does not obtain its nutrients. Dark and golden flax seed is rich in omega-3 fatty acids which help to reduce blood cholesterol, and may reduce the risk of heart attack or atherosclerosis. Because of its high fiber content, flax seed acts as a mild laxative to help ease the transition of stools through the intestines. MayoClinic.com recommends that adults consume between 1.1 and 1.6 grams of ground flax seed per day. According to MedlinePlus, both brown and golden flax seed lower blood sugar levels, over a period of three months, for people with Type II diabetes. However, it was shown to be ineffective at lowering insulin levels, fasting blood sugar or blood fat levels in the same group. 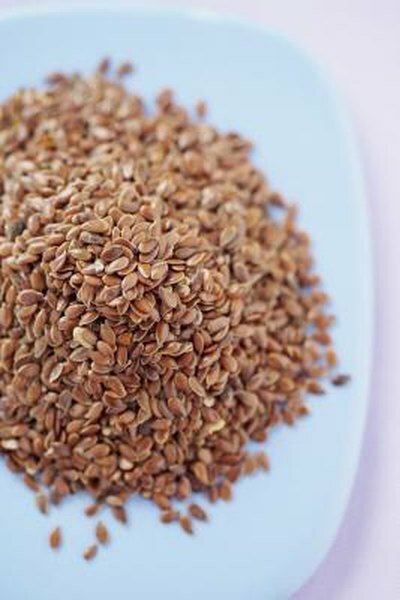 An intake of 40 milligrams of flaxseed daily may also improve hot flashes and night sweats in women with mild menopause symptoms. Take supplements such as vitamins one hour before, or two hours after, consuming flax seed, because flax seed may inhibit the absorption of some nutrients. Do not take flax seed with other laxatives or with blood thinners. Mayo Clinic: Does ground flaxseed have more health benefits than whole flaxseed?